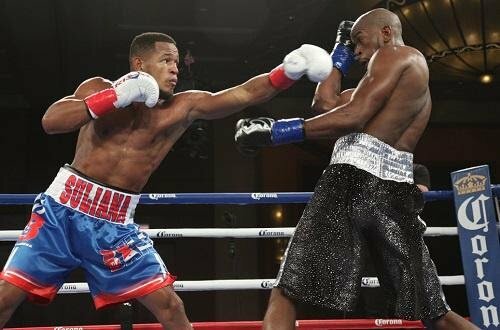 By Jim Dower: Light heavyweight contender Sullivan Barrera (20-1, 14 KOs) will be fighting former interim WBA World light heavyweight champion Felix Valera (15-1, 13 KOs) in a 10 round fight on November 25 on the undercard of the Sergey Kovalev vs. Vyacheslav Sharbranskyy fight at Madison Square Garden in New York. Barrera vs. Valera will be televised on HBO Boxing. The Barrera-Valera fight is signed, according to ESPN. It still needs to be announced by the promoters for the two fighters. Barrera is ranked #2 WBA, #3 WBC, #3 WBO, #11 IBF at light heavyweight. Barrera wasn’t too happy recently with Dmitry Bivol being elevated to the full WBA light heavyweight title position by the World Boxing Association without facing him. Before the WBA made Bivol their champion at 175, he was scheduled to fight #12 WBA Trent Broadhurst for the title. Barrera felt that he should be the one fighting Bivol, as he’s rated No.2 with the WBA. However, now that the WBA has installed Bivol as their champion at light heavyweight, it’s no longer an issue. Valera is ranked #9 WBA. He’s won his last 2 fights since losing to Bivol by a 12 round unanimous decision last year on May 21. Bivol beat Valera by the scores 119-107, 119-107 and 116-111. Bivol knocked Valera down in round 6 and 8. It wasn’t competitive. It’ll be great to see how Barrera does against Valera so that the boxing fans can compare him to how Bivol did in beating the 29-year-old fighter from the Dominican Republic. Valera turned pro in 2012, and his best wins have come against Stanslav Kashtanov, Gusmyr Perdomo and Emiliano Cayetano. Valera is a good fighter, but he’s not show that quality that he needs for him to beat the best. Bivol handled Valera with ease in their fight last year. Whether Barrera can do the same is the big question. The 35-year-old Barrera has won his last 3 fights since losing to Andre Ward last year by a 12 round unanimous decision on March 26. Before that loss, Barrera was looking very good in beating guys like Karo Murat, Rowland Bryant, Jeff Lacy and Hakim Zoulikha. In Barrera’s last 2 fights, he’s beaten Vyacheslav Shabranskyy, Paul Parker and Joe Smith Jr. Those were impressive wins for Barrera. It’s going to be extremely difficult for Valera to win this fight based on how he’s looked lately. Valera is a good basic fighter, but Barrera is fighting on another level right now. If Valera is going to win this fight, he’s going to need to find a different gear than the one that he’s been showing recently. Valera has some good punching power, but he’s going to need to use it early against Barrera if he wants to win this fight. Barrera has heavy hands, and he’s on a roll right now with 3 consecutive wins.